Paul Smyth looks set for loan move away from Queens Park Rangers this January. 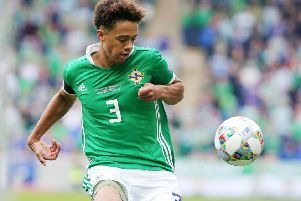 The 21-year-old, who is in the Northern Ireland squad for Thursday night's friendly against the Republic of ireland in Dublin, is one of several QPR players who are available for short-term moves away from Loftus Road. Smyth has struggled to break into the side since Steve McClaren took over in the summer. His last appearance came against Sheffield United in August when he was subbed at half time. The former Linfield man is still regarded by Rangers as a good prospect and is likely to spend the second half of the season elsewhere in order for him to pick up more first-team appearance.